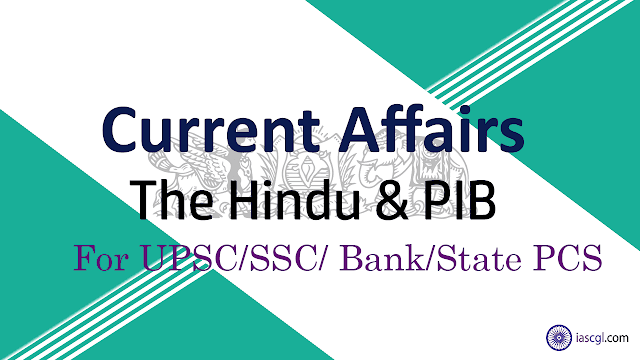 20th September 2018, Current Affairs and News Analysis for UPSC Civil Service Examination, SSC CGL and State Civil Service Examinations. Union Minister of State (independent charge) for Development of North Eastern Region (DoNER), MoS PMO, Personnel, Public Grievances & Pensions Jitendra Singh will inaugurate the All India Pension Adalat. 'Pension Court' was started by the Department of Personnel, Public Grievances and Pension, Government of India, Pension and Pensioner Welfare Department. With this, 6 pensioners were honored with the 'Experience' Award, 2018, to make significant contributions to the work of organizing institutional memory for the departments. On the challenge of Prime Minister Narendra Modi, the 'Experience Scheme' was started in 2015. Through this, work has been done to ensure the right of pensioners 'ease of living'. In fact, with the help of this, efforts have been made to provide pensioners with the hassle free administrative system for redressal of their grievances. Pension courts have been started with the objective to bring various cases like dissatisfied pensioners, related departments, banks or CGHS representatives, i.e. wherever relevant, to a forum, so that the existing rules of related matters Could be settled within. In addition to the pension court, the work of providing pre-retirement counseling (PRC) to the Central Government employees who retire in the next 6 months is also done. The purpose of the PRC workshop is not only to raise awareness of their rights in the employees after retirement, but also to educate them regarding advance plans, including participation in medical facilities and voluntary activities. Aiming for greater transparency in according security clearances to business proposals relating to sensitive sectors and geographical locations, the home ministry on Tuesday launched a portal that will enable individuals and private companies to submit applications and view their status online. In order to facilitate security clearance before starting business in certain sensitive areas of the country, the Government has started a portal 'E-Sahasam'. This will bring transparency and speed in the process of security clearance. Before granting licenses / permits / sanction / contracts etc. to companies, bidders and individuals in certain sensitive areas, the Home Ministry is a nodal ministry to provide security related clearances. The objective of the National Security Sanction is to evaluate the potential safety hazards, including financial threats and to provide assessment of risk before approving investment and project proposals in key areas. Its aim is to establish a healthy balance between fulfilling the national security requirements and facilitating business and promoting investment in the country. After more than a dozen years of arguing over whether Pluto is a planet, in 2006 the International Astronomical Union (IAU) voted to remove Pluto’s planetary status. Now some researchers are challenging this decision, citing the manner in which scientific tradition has dealt with the taxonomy of planets. The IAU, in 2006, designated Pluto a ‘dwarf planet’ along with Ceres in the asteroid belt and Xena, an object in the Kuiper belt, which is an icy ring of frozen objects that circle the solar system beyond Neptune’s orbit. It was a bid to overcome sentiment and go by scientific rationale. 'Dwarf planets', on the other hand, need to only satisfy the first two conditions. With this third property, if an object ventures close to a planet’s orbit, it will either collide with it and be accreted, or be ejected out. However, Pluto is affected by Neptune’s gravity. It also shares its orbit with the frozen objects in the Kuiper belt. Based on this, the IAU deemed that Pluto did not ‘clear its orbit’. Third rule - The above rationale has been questioned by some who put forth several exceptions to the third rule. They cite the manner in which scientific tradition has dealt with the taxonomy of planets. The only work in history that used the third rule to classify planets was an article by William Herschel in 1802. It is also argued that this work was based on reasoning and observations that have since been disproved. However, the argument is not a strong enough case to give up what is, in fact, a sensible rule. Evidently, physics has many examples where an idea once discarded for being incorrect, later emerged in a different form and gained acceptance. Planet - Given these, even if Pluto were to be re-designated a planet, many more complications would arise. The Army, which is inducting the indigenously developed Akash short-range surface-to-air missile (SRSAM) system, will get an upgraded variant. The Defence Acquisition Council (DAC) gave its procedural approval to the variant. The Army has already inducted two Akash regiments, and ordered two more last year after a global tender for the SRSAM was cancelled. The Akash system has since been upgraded, and the DAC has now approved an upgraded variant for the third and fourth regiments. The upgraded version will include the seeker technology and possess a 360-degree coverage, and will be of compact configuration. It is operationally critical equipment, which will provide protection to vital assets. The DAC also gave approval for the development of an individual under-water breathing apparatus for the T-90 tank. The apparatus is used by the tank crew for emergency escape. DRDO developed Akash as part of the Integrated Guided Missile Development Programme which was initiated in 1984. It is made by Bharat Dynamics Limited (BDL). Akash has a range of 25 km and can engage multiple targets at a time in all-weather conditions. It has a large operational envelope, from 30 meter to a maximum of 20 km. Each regiment consists of six launchers, each having three missiles. Akash missile has an indigenous content of 96 per cent. 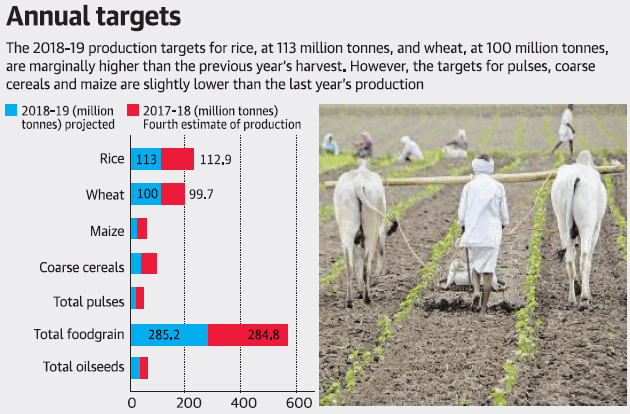 The Agriculture Ministry has set a foodgrain production target of 285.2 million tonnes for 2018-19, a marginal increase from the previous year’s harvest of 284.8 million tonnes. In the years of normal monsoons and record harvests, prices of several commodities have crash, hurting many farmers. In case of government procurement, shortage of storage capacity. In States like Rajasthan, Maharashtra, Gujarat and Madhya Pradesh, there is no space left in the godowns. The Securities and Exchange Board of India (SEBI) has broadly accepted the recommendations of the H.R. Khan Committee on Know-Your-Client requirements for foreign portfolio investors (FPIs), while lowering the total expense ratio (TER) for open-ended equity schemes, thereby making it less expensive for investors to invest in mutual funds. 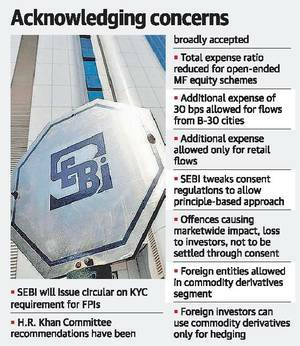 “SEBI has agreed to amend the circular [issued in April] and the new one is largely in line with Khan Committee recommendations”. Expense Ratio: It is the annual fee charged by the mutual fund scheme to manage money on behalf of individuals. It covers the fund manager’s fee along with other expenses required to run the fund administration. SEBI capped the total expense ratio (TER) for equity-oriented mutual fund schemes (close-ended and interval schemes) at 1.25% and for other schemes at 1%. However, it allowed an extra 30 basis points (bps) for selling in B-30 (beyond top 30) cities. One basis point is one-hundredth of a percentage point. The TER cap for fund of funds will be 2.25% for equity-oriented schemes and 2% for other schemes. 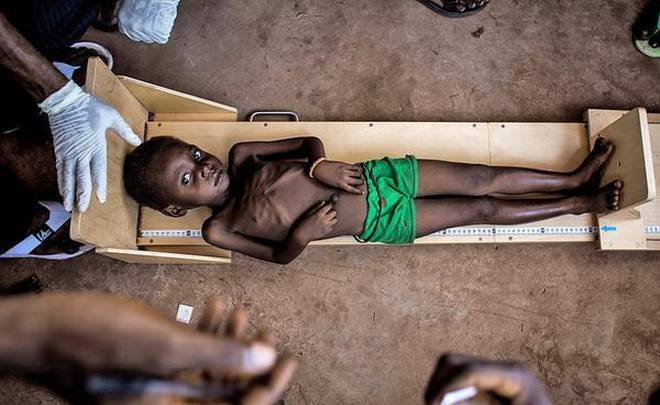 An estimated 6.3 million children under 15 years of age died in 2017, or 1 every 5 seconds, mostly of preventable causes, according to the new mortality estimates released by UNICEF, the World Health Organization (WHO), the United Nations Population Division and the World Bank Group. In 2017, 2.5 million newborns died in their first month while 5.4 million deaths — occur in the first five years of life, with newborns accounting for around half of the deaths. The report notes that for children everywhere, the most risky period of life is the first month. Under-five mortality rates among children in rural areas are, on average, 50% higher than among children in urban areas. In addition, those born to uneducated mothers are more than twice more likely to die before turning five than those born to mothers with a secondary or higher education. Most children under 5 die due to preventable or treatable causes such as complications during birth, pneumonia, diarrhea, neonatal sepsis and malaria. Among children between 5 and 14 years of age, injuries become a more prominent cause of death, especially from drowning and road traffic. Within this age group, regional differences exist, with the risk of dying for a child from sub-Saharan Africa 15 times higher than in Europe. Bollywood actors Varun Dhawan and Anushka Sharma were signed as the ambassadors of Skill India Campaign to promote and endorse the Skill India Mission, chaired by Prime Minister Narendra Modi. The film highlights the untapped potential of India’s talented craftsmen and skilled workers at the grassroot level.